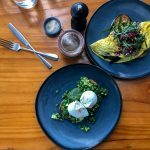 If it’s ‘food for body and soul’ you seek, then Manna Haven Café in Byron Bay should leave you feeling nourished and maybe even a little enlightened. 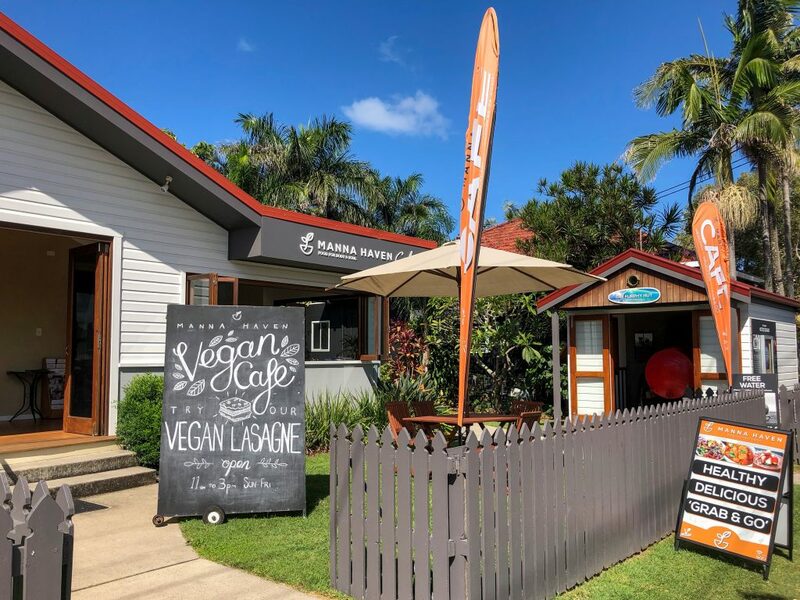 The vegetarian café, located in the heart of Byron Bay on Jonson Street, is a ministry of the Seventh Day Adventist Church. 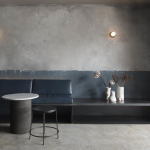 It’s where a faithful following of locals and health conscious travellers congregate for plant-based eats without the high prices. 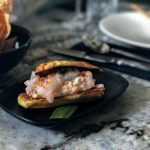 Manna Haven serves meals from 11am – 3pm Sunday to Friday. According to scripture from the Bible, ‘manna’ was a food dropped from the heavens to save Moses and his people from dying of hunger in the desert. At Manna Haven Café, the food doesn’t come from up above, however diners can choose their own ‘manna’ from a range of healthy hot dishes, salads, smoothies, drinks and sweets. 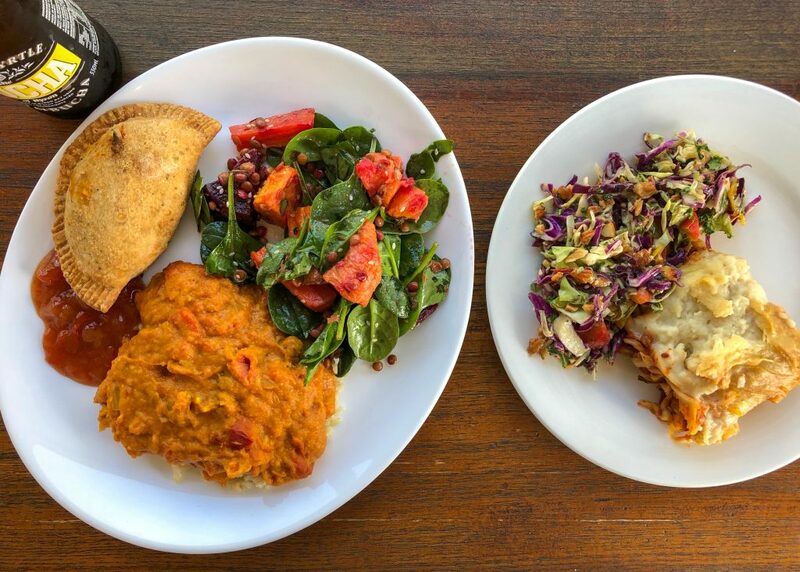 The menu at Manna Haven Café changes weekly and almost all dishes are vegan. There are plenty of gluten-free, sugar free and raw menu options available as well. Hot dishes include Cauliflower Chickpea Satay, Vegetable Pakoras and the infamous Pumpkin and Mushroom Lasagne. It’s creamy and delicious and hard to resist. 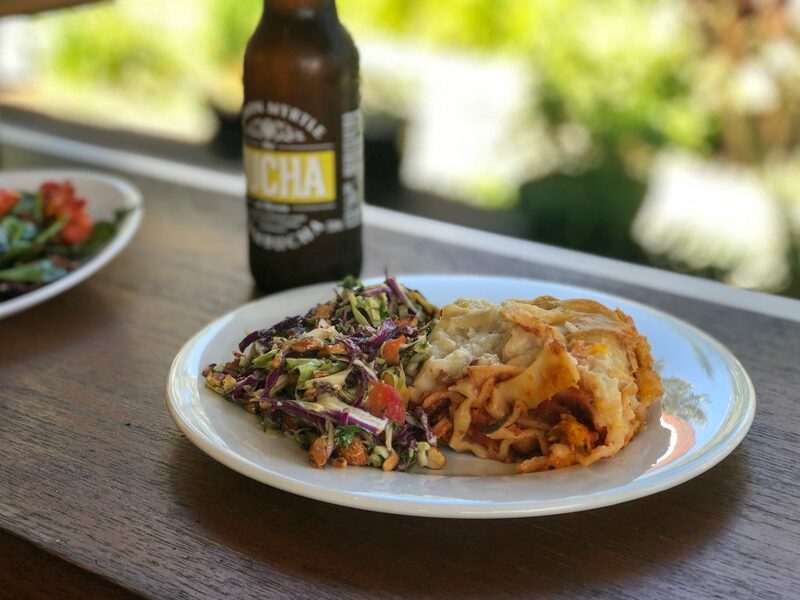 There is always a good range of freshly prepared salads on the side to choose from like the Crunchy Satay Salad, Roasted Vegetable and Lentil Salad and Tangy Courgette Slaw with Tahini Dressing. Hot dishes and salads are served to you bain-marie style. You can choose two dishes for $13 and three dishes for $16 (savoury and / or salad) which is quite good value. The sweets cabinet includes a range of treats like Superfood Bliss Balls, Chia Puddings, Raw Apricot and Ginger Slice and Gluten Free Vegan Chocolate Mousse cake. If you have a celebration coming up the folk at Manna Haven can create delicious cakes and desserts for you to order. For hot drinks you can choose from Chai, Herbal Tea and Hot Chocolate. No coffee I’m afraid, but there’s plenty of beans on the brew all over Byron Bay so you can get your fix elsewhere! From the fridge there is a small selection of bottled drinks including local favourite Bucha of Byron Kombucha. There are smoothies too like the Manna Mango and the Berry Blast priced at $8. 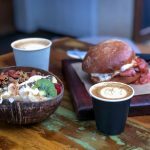 Manna Haven Café is a peaceful oasis in the busyness of Byron Bay. The café is light and breezy with seating inside and out overlooking gardens. If time isn’t on your side, you can ‘grab and go’ your meal to takeaway. 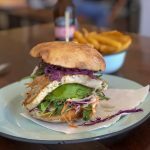 Manna Haven Café in Byron Bay has answered the prayers of those in Byron Bay who seek wholesome, vegetarian food with flavour that’s fairly priced.